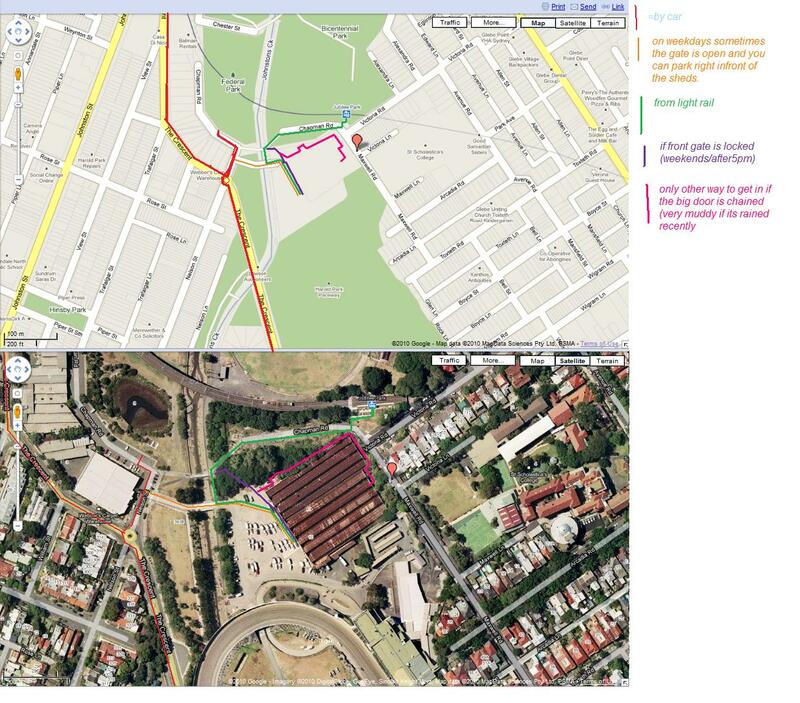 Glebe tram sheds, are owned by Harrold Park Paceway. You’ve probably have seen them on tv but didn’t even know it (most recently chanel 10-so you think you can dance, also a lot a ad’s get filmed there). 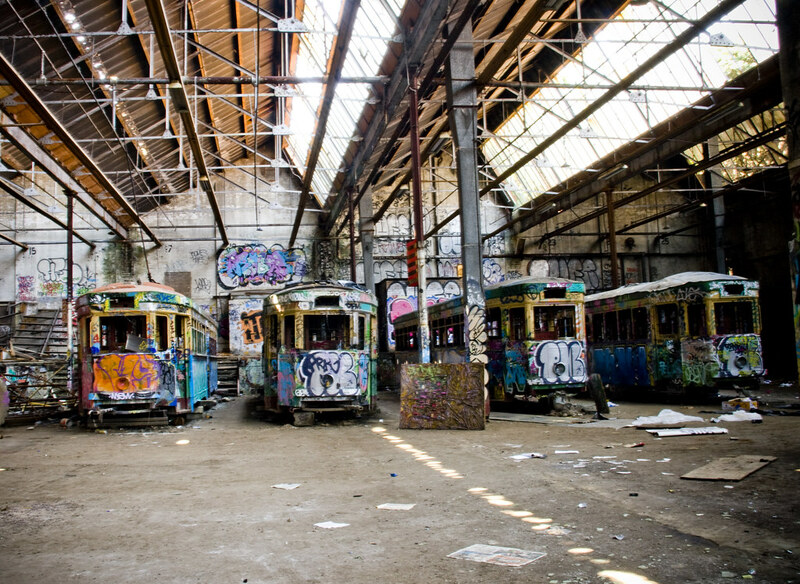 Inside the glorious sheds are five beat up, broken, graffiti-fied trams….and one bus. the sheds are split in two by a wall, one side has trams+bus and a bunch of rooms good for exploring and the other side has some windows, a dirty pond were all the rainwaters have collected, a huge pile of blue and yellow chairs and some other random stuff. There is alot of graffiti and random stuff lying around. You can view the video on the making of this image, or how I post processed it. Brent> I’ve shot here at night, and it is very creepy and freaky. From a security perspective I would avoid this place on Friday or Saturday night unless you want to come face-to-face with the local party-goers. I would also recommend that you shoot this with a group if you are going to photograph it at night. I say weekdays because the gate is usually open, there’s less people coming in cos they’re all at work or uni etc….you get alot more people going in there on the weekend. It’s a good place to shoot midday-sun or rainy days because its most covered. Just watch where you put your stuff when its raining because the roof leaks in places. You can get there by light rain, get off at the jubilee park stop , and its a 3 mintue walk. If driving you you need tp be on a road called “the crescent’ and turn into chapman rd at the round’a’bout. you can usually get a Parking spot infront of the park pretty easily. You can usually get in via the huge doors on the right. NOTE: if the big door at the front is chained up you need to enter via the back entrance, which is a small passage way that doesnt get used alot (take a spider killing stick). if its rained recently it’ll be muddy. and you’ll have to climb 4 crates to get in. Would second the recommendation for strong shoes. It’s not always possible to drive right to the door, but walking access is through the gap in the fence next to the main gates. Why the ‘Copy of…’ in the title? if you go around to the left of the where the fence starts…..you can just walk in near the big tree….no fence. Recent visit — Thanks so much for sharing this – a group of us from POTD site (http://potd.com.au) went there last weekend and had a great time. Very difficult to get in round the back – incredibly muddy (recommend gum boots!) and lots of broken glass, water etc etc inside. We took a small step ladder which helped get in the window round the back (several of us were over 50). Still trams and buses there so we had a magic time. Will link to some photos when I get them processed – you can see some of the others on teh POTD site. Well if you had members over 50, then you all did well. I’m sure that you trashed a few pairs of shoes in the process, but I’ll bet it added to the sense of adventure. I’m glad you all had a such a good time and look forward to seeing some of your shots. Thank you — Thanks for the great location. This knol came in handy when I tried to figure my way in earlier this year. I ended up re-reading it on my iPhone as I stood outside, infront of the sheds. Fantastic Place! — Being an amateur photographer who had recently graduated from high school and not yet to have my P’s so that I could drive. 2 of my mates & I set out by train & a walk to visit this place to take photo’s and it was simply a fantastic place to take photos. Would definitely love to know some more places easily accessible by trains. Heads up, doors welded shut — Only access is a muddy trek around the northern side of the building to the window in back. Climbing in is easy and the plus is you are much more likely to have the place to your self. Why would they weld the door but leave the back open?? Went there recently. — I was there on 27 Nov 2010 and front doors were srtill open. Have they been locked since? Lots of water (3-4 inches) across entire floor with more running in at eastern end via a huge hose/pipe. BTW I found out that the tram second from right when looking from main doors was actually the last tram ever to run in Sydney. Many thanks for a great guide. Used it when I went there for a quick reccy and hope to go back for a proper shoot. And….. — Don’t know how likely this is, maybe has something to do with doors being welded shut. wow — thanks so much for sharing, absolutely loved your video as well. What kind of video camera do you use? the quality is just great! recently — hi, just wondering if anyone has been in there recently? Went there a couple of weeks ago on a cloudy sunday arvo, was pretty empty and the doors open, no problems getting in. Spent about 3 hours in there and about 3 other parties came and went during that time. Anything specific you’d like to know? I was thinking the same question, thanks Trixie, i’m def. going to check it out one day. btw, Can I get in there for free? still curious about that . .
Tramsheds and Harold Park Paceway sold to Mirvac. — Mirvac will be building apartments on the site of the race track. The tramsheds are not (yet) to be knocked down in the initial stages of the project. I have no idea if they will be preserved. But the whole lot has been fenced off. And they seem to be working there on saturdays too. So I did not try to get in. I think I missed out by a couple of weeks. Tramsheds – no access thru main doors. — I’ve been to the Tramsheds several times before to photograph & access is now quite difficult. We were there 2 wks previously & there were double fences surrounding the site with a lot construction work. We were still able to get in & shoot. I went back there last sunday with a couple of mates for one final time – we knew time was running out there. Both the main doors were blocked with concrete barricades. There is a way in through a window at the back of the building by going around the right hand side & we got in ok but we were busted by security no more than 5mins after we got there & were asked to leave. I’m pretty sure the security guy sits up in the Harold park building to the right of the tramsheds. So unfortunately I think its pretty much the end of an era. hardly any access left — I traveled to the tram sheds today and access is extremely difficult. we entered through a hole at the bottom of a gate just outside the exit on jubilee tram station, to then have to climb a few rocks in order to jump over a barbed wire fence. there are very narrow passageways, less then a metre wide, leading right around the sides and back of the tram sheds, giving you full view into them through caged off windows. These passageways are extremely muddy… i wouldnt wear good shoes. Apparently you could get in through a back window, but this has now been barred off. after walking the whole back of the sheds trying to find a window to get in through, we left the way we came and then went through jubilee park past the double fenced off construction site to find a plank of wood leaning up against a fence to access it by. this was extremely risky as you have to cross the whole construction site in order to access the sheds. we got in through the bent open left door which was blocked by cement barricades and had a look around for about 5 minutes before being asked to leave by security. the guards were actually quite reasonable and we had a pretty good conversation with them about the sheds. they said the sheds arent being knocked down as they are full of asbestos inside, and that people are going to start being arrested for trespassing soon. looks like there wont be many more fun adventures like the one we had today to the beautiful sheds anymore. Hardly any access at all — Me and 2 others went to check out and get some photos of the trams last night, Which ended up with 2 of us being cornered where we were hiding and then arrested and cuffed by the security guards and then handed off to police for a $350 fine for “trespassing without reason etc” and the last person out running one of the guards to freedom by jumping 2 fences in the end. As the previous comment mentioned actually getting into the building is becoming quite a hassle and requires a fair bit of determination. The only way we saw to get in was by climbing through some of the main doors which you needed to be fairly skinny or fairly skilled at climbing to get through either. To all others wishing to enter the site let this be a warning that charges will be laid to ANYONE now caught on site……………………. Sorry to hear about your misadventures. Sounds like this location is over as a photographic location. It’s a shame, but I hope plenty of photographers did get the chance to photograph it. Doesn’t worth!! — Guys, we’ve been arrested there yesterday – on Sunday evening. Police officers asked us to warn others about new conditions in tram sheds. After reading comments I see that we were lucky… no dogs. If there were any, we would leave all our photo equipment there.. Chased by vicious dogs and got arrested and charged — Last night me and 2 friends went to the tram sheds to take a few photos that were trying to get before they knock down the tram sheds, then all of a sudden me and my 2 friends that were there were chased by 2 german shepherds and one massive rotweiler, the dogs were foaming at the mouth, me and my friends managed to get on the roof of a shipping container and we were safe from the dogs where the dogs could not get to us, then after 5 minutes later 6 security guards turned up to where we were and got a hold of the dogs then told us to get down from the container, the security guards then handcuffed me and my friends and told us we were under arrest, the police then came and took us to the police station, where we were all charged with break and enter and trespass without reason, the security guards also had video footage of me and my friends cutting the fence to get to the tram sheds as they have secuirty cameras hidden in the trees facing the fence lines. If anyone is thinking of going there to take photos it isnt a good idea as you might get bitten by dogs or arrested. Security guards, cameras and dogs. Not recommended. — I came here as a photographer with a pair of acrobats to take some photos on Friday. I didn’t realise it was so heavily patrolled. We were arrested when leaving, the police were called and the security guard insisted that any photos we took had to be deleted. I feel terrible for the security guard that arrested us. Surely he suffered a horrendous trauma during childhood because in his winter years he’s decidedly bitter without even a glimmer of compassion for his fellow man. His saddening lust for power has resulted workplace overcompensation… and it’s… well it’s such a shame. The building is apparently heritage listed and won’t be torn down. If you’re looking for cool warehouses, I’d recommend looking elsewhere. Hiya… My fiancé and I were hoping to have our wedding photos done at the tram yard but after reading these posts and seeing the development that’s currently underway there we’re looking for somewhere else. 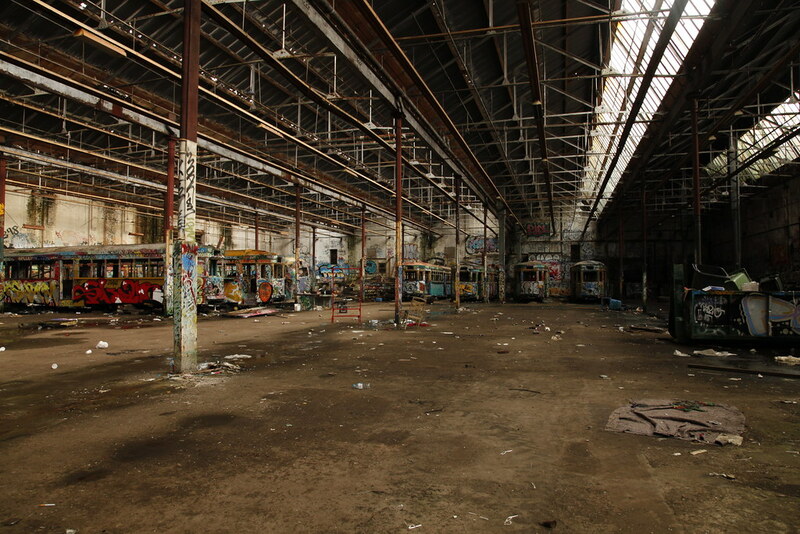 We love the idea of an old abandond graffiti covered space. Can anyone recommend somewhere similar we could do our photos? Hi Tilly, unfortunately they are no longer readily accessible, plus they’ve been cleaned up by CoS Council to make way for adaptive re-use of the sheds as part of the Harold Park redevelopment. A big loss for photographers and artists but hopefully positive for the community. Thats a real shame!!! thank you so much for finding the time to reply! this building ? if so could someone please message me details 🙂 .